EPI Redux is re-imagining of the psychedelic classic The Exploding Plastic Inevitable, created by Andy Warhol with the Velvet Underground in the late 1960s. Rather than literally interpreting the original Warhol event, EPI Redux seeks to update psychedelia for the new millennium. Using an excess of technology the project immerses viewers in an overload of the senses and in a Gesamtkunstwerk where sound, vision, space and time coincide. The core concept behind EPI Redux resides in both its communal nature and in its long-form. The piece has been performed by as few as two performers and as many as eleven. As all the performers are expert in their mediums this reconfiguration allows for considerable amount of spontaneity, while at the same time calling on them to apply their analytical skills in real-time. The modularity of the piece similarly allows it to take several forms and keeps the content both loose and ever-evolving. In this way the Redux is similar to the Warhol original, even as it veers dramatically from the sound and visual world of the late 60s. Switzerland’s Stefan Müller Arisona and Victoria, BC’s Steve Gibson are media artists who have established a strong footing in academia while keeping their fingers on the throbbing pulse of the club scene, DJ-ing and VJ-ing underground. Grounded in the history of audiovisual tinkering, they take creative hints from illustrious forebearers to push multimedia environments into the next realm. 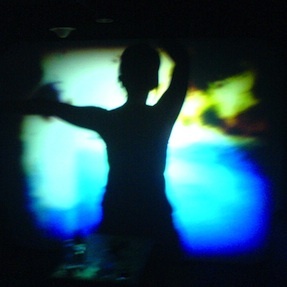 Müller Arisona and Gibson joined forces in 2006 to create a digital-age reenactment of The Exploding Plastic Inevitable, the boundary-breaking multimedia show conceived in the 1960’s by Andy Warhol with the complicity of Lou Reed and his cult rock act The Velvet Underground. A full-blown sensorium featuring giant projections of Warhol’s films, The Velvet Underground at their most dazzlingly abrasive, and dancers let loose from Warhol’s New-Yorker Factory, the original Exploding Plastic Inevitable (1966-1967) was, while it lasted, the most unique and effective discotheque environment prior to the advent of venues such as the Fillmore in San Francisco. In many ways, it remains a benchmark for all subsequent immersive multimedia shows. Originated under the auspices of ETH Zurich’s “Digital Art Weeks” and Victoria’s “Interactive Futures”, Müller Arisona and Gibson’s take on Warhol’s circus makes full use of digital technology and the free-flowing, associative thinking of the techno age. Armed with multiple projectors, a barrage of laptop computers and additional data-churning devices, the pair have already performed in Zurich, Victoria, Chicago, Vancouver and Shanghai. 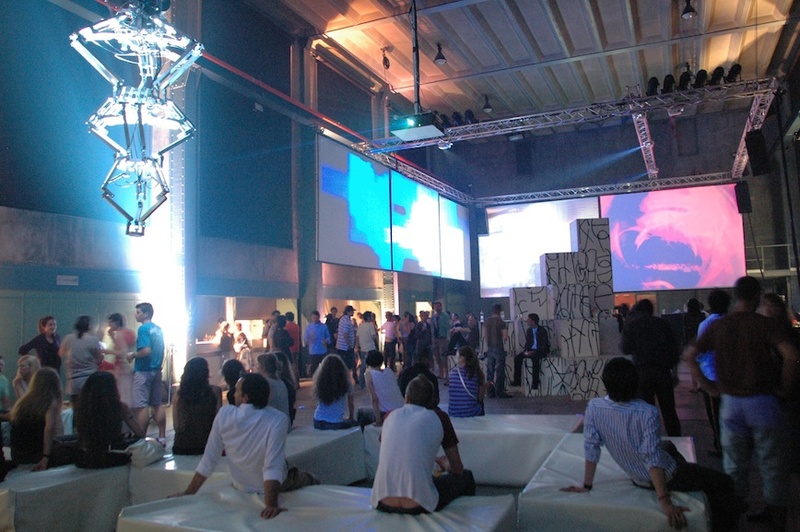 Using custom software, live vocals, keyboards and live video processing Müller Arisona and Gibson create an immersive audio-visual experience which mimics the psychedelic atmosphere of the original EPI event, while at the same time updating the audio-visual language to the 21st Century. Nov 17 2007 – Interactive Futures, Open Space, Victoria, Canada. This entry was posted in Digital Art, Music and tagged Corebounce, Digital Art Weeks, Interactive Futures, Marcel Reimer, Portfolio, Scheinwerfer, Simon Schubiger, Soundium, Steve Gibson, Tom Kuo, Zouk Singapore on October 31, 2010 by robot.